Whenever I say that auroras are a very common phenomenon in virtually any planet that has magnetic field. 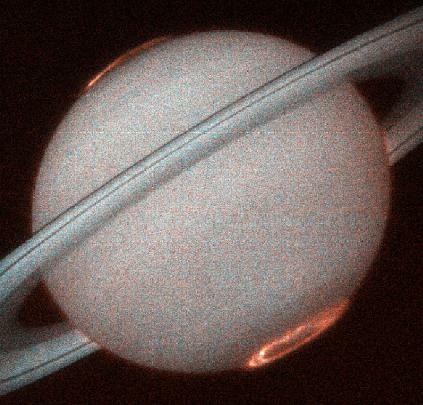 An example, Saturn with its rings (and auroras). That image (which is old) was taken in the ultraviolet because the atmosphere of this planet, gas, flattened noses, is composed (mostly) hydrogen and helium. Oddly enough, the hydrogen reacts with atmospheric energy particles our beloved Sun, react with hydrogen emitting energy in the ultraviolet band. This tells us that auroras have all planets with magnetic field, but like these auroras depend on the composition of the outer layers of the atmosphere or the planet as they are against the energetic particles give pitch. The curious thing about this process is that although there are methods against light to check the atmospheres of the planets, through this phenomenon can be checked. This has helped, for example, do simulations loss of Mars’ atmosphere because the solar wind (among other things) and to calculate how much atmosphere thanks to the images of the Martian auroras was lost (among other things, I repeat).